Use these tips to transform your kitchen! Are you venturing into the world of interior design? 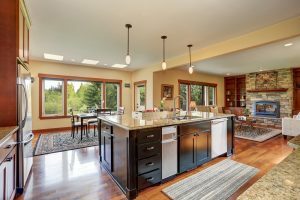 When it comes to painting your kitchen, there are some rules you should follow to ensure that the job will look its best. Read on for five tips for painting your kitchen. Because the kitchen is such a central location in the home, the colors that you choose will make a great impression on your family and everyone that comes over. With that said, look for colors that will make the best visual impact and align with food and eating. Natural colors, neutral tones, and shades in the green family look great in the kitchen. Try to avoid blue as blue is known to dull the appetite. The paint finish that you choose will ultimately determine the way your paint will look on the walls. Matte is a flat, non-shiny option while at the other end of the spectrum is glossy, which adds more shine to the area. Since satin and semi-gloss fall somewhere in the middle between matte and glossy, they are the best choices for kitchen applications. They are easy to wipe down, yet flat enough to hide imperfections. Before you head to the paint store, you should measure the surface area in your kitchen that you plan to paint. It will be helpful to know the square footage so that you know how much paint you’ll need to buy. For an empty kitchen, multiply the room height by the room length and add up the walls to get the total. In a finished kitchen, it’s a great idea to act as if you’re painting an empty room, saving what’s left over for touch-ups. Unless you’re painting a surface of fresh drywall, it’s important before you get started to make sure that the surfaces are clean. Use a mixture of warm water and trisodium phosphate, especially for the areas around the stove and counters, and including the door trim. Also, keep an eye out for dust and cobwebs. Your choices for painting are the brush, roller, or spray paint. In empty kitchens, you can use a roller or sprayer, while getting those areas that require more precision with the brush. In finished kitchens, stick to the roller and brush to get the job done.